Fall is in the air (or at least getting close on the calendar) and I have another cute wreath to share today. Check out this clever popcorn wreath that Ashley from Cherished Bliss made. 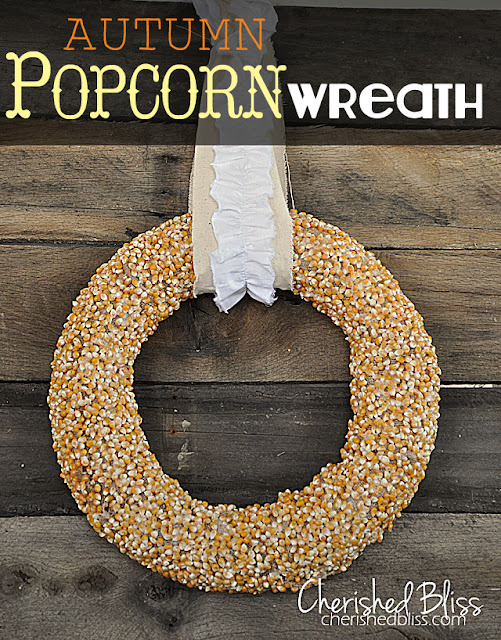 Popcorn, burlap and an innovative base make this fun wreath. Check out the full tutorial on Cherished Bliss, and be sure to keep up with Ashley’s clever projects on Facebook, Twitter, Instagram, Pinterest and Google Plus. Thanks so much Vivienne! : ) Have a great week! DIY Fall Apothecary Jars from Uncommon Designs.